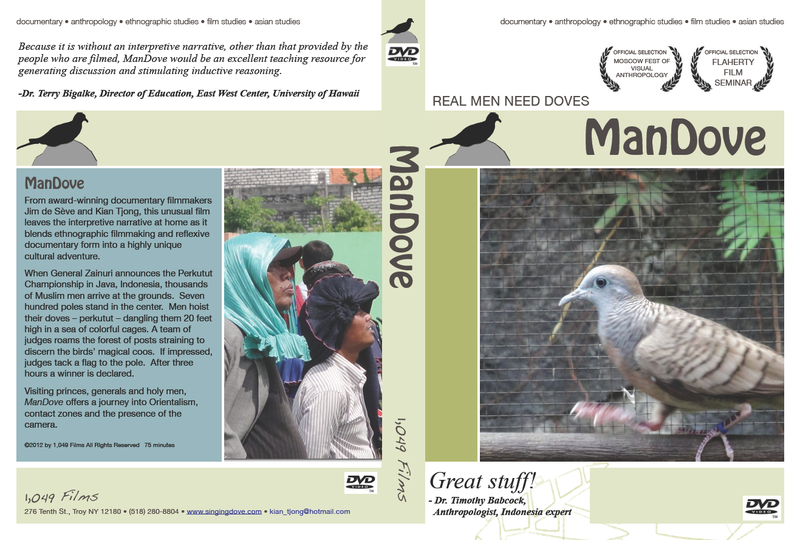 Order a copy of the ManDove DVD from 1,049 Films and Match Cut Media Inc.
Because it is without an interpretive narrative, other than that provided by the people who are filmed, ManDove would be an excellent teaching resource for generating discussion and stimulating inductive reasoning. From award-winning documentary filmmakers Jim de Sève and Kian Tjong, this unusual film leaves the interpretive narrative at home as it blends ethnographic filmmaking and reflexive documentary form into a highly unique cultural adventure. When General Zainuri announces the Perkutut Championship in Java, Indonesia, thousands of Muslim men arrive at the grounds. Seven hundred poles stand in the center. Men hoist their doves – perkutut – dangling them 20 feet high in a sea of colorful cages. A team of judges roams the forest of posts straining to discern the birds’ magical coos. If impressed, judges tack a flag to the pole. After three hours a winner is declared.